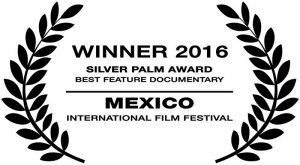 South Texas Gentle Men of Steel – Los Padres, a feature documentary, won the 2016 Silver Palm Award at the Mexico International Film Festival. The film was selected from among hundreds of entries from over 30 countries around the world as the competition’s very best. The documentary is about the end of an 82-year presence of Dominican friars in central South Texas, near Corpus Christi, with the departure in 2013 of the last two Dominican friars, Fathers Epifanio “Epi” Rodriguez, and Benito Retortillo. Dominican friars, headquartered in San Diego, had a powerful and lasting impact on the lives of many, especially on how their presence assisted many Mexican-Americans struggle against harsh racism, which bespeaks of the experiences of many in the Southwest. This film has also won: Award of Merit, Documentary Feature, awarded by The Accolade Global Film Competition; Gold Award, Documentary Feature, Gold Award, Directing and Gold Award, Animated Visuals, International Independent Film Awards; Award of Excellence, History/Biographical, and Award of Merit Special Mention, The IndieFest Film Awards; Best Documentary, iHolly: Next Generation Independent Film Festival; and Gold Remi Award, WorldFest Houston. The documentary is written-produced-directed by Southern Friar Armando P. Ibañez, and produced by Pluma Pictures, Inc., a non-profit film production company, and Prospect House Entertainment.